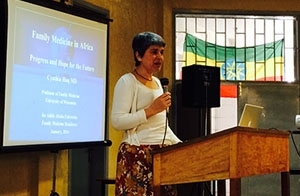 Cynthia Haq, MD, speaks at Ethiopia’s Addis Ababa University. She and DFMCH colleagues helped developed the country’s first family medicine residency program. Over the past five years, the UW Department of Family Medicine and Community Health’s (DFMCH) Cynthia Haq, MD, has been instrumental in advancing family medicine education in Ethiopia. Through partnerships with the University of Toronto, the Ethiopian Ministry of Health, and Addis Ababa University (AAU), Dr. Haq—along with colleague Ann Evensen, MD, former resident Elizabeth Kvach, MD, and fellow James Conniff, MD—has helped develop the first family medicine residency program in Ethiopia. Drs. Haq and Kvach traveled to Ethiopia in January to celebrate the residency program’s third year, train physicians in Advanced Life Support in Obstetrics (ALSO®), and promote gender equity for female faculty. Cynthia Haq, MD, presents the history of family medicine in Africa at Addis Ababa University. Efforts to introduce family medicine as a strategy for improving health care in Ethiopia have been underway for many years. That work gained strength in 2010, thanks to the five-year, National Institutes of Health-supported Medical Education Partnership Initiative (MEPI) between Addis Ababa University (AAU) and the University of Wisconsin. The UW collaboration was spearheaded by Girma Tefera, MD, a UW vascular surgeon and native of Ethiopia. In 2012, Dr. Haq facilitated a family medicine faculty development fellowship for AAU faculty. Later that year, she and colleagues from the University of Toronto collaborated to help AAU plan its new family medicine residency program. On February 4, 2013, the new program launched, welcoming eight residents. Now in its third year, the program has enrolled 22 residents. During a visit in January 2015, DFMCH faculty and colleagues celebrated this accomplishment and provided recommendations for future development, which include expanding the program to two additional universities in Ethiopia. “The primary contribution of the UW team was to serve as teachers, catalysts and facilitators of the work in progress at AAU,” Dr. Haq explained. In addition, during that and previous visits, Drs. Evensen, Kvach, and Conniff led several ALSO Provider and Instructor training sessions for AAU family medicine, emergency medicine, and obstetrics residents—critical education in a nation where 16 percent of deaths in reproductive-age women are due to maternal causes (Source: World Health Organization). Dr. Evensen will be returning to Ethiopia this summer to act as a resident supervisor and to conduct a needs assessment for family medicine faculty development with Dr. Sawra Getnet, a second-year AAU family medicine resident. They are collaborating with an international network of family physicians who are conducting similar needs assessments across sub-Saharan Africa. As part of the MEPI project, DFMCH and UW School of Medicine and Public Health (SMPH) faculty also worked to promote gender equity among Ethiopian female faculty and learners. Seven Ethiopian women faculty—from AAU, Haramaya University and Hawassa University—participated in SMPH-hosted fellowships to promote leadership development. Those fellows and their UW colleagues then held meetings at AAU to identify gender equity concerns and to conduct a formal survey of female students and academic staff. Their work resulted in an action plan for AAU, which focuses on developing institutional policies on gender inequality, enhancing institutional resources in support of women and raising awareness of gender equity issues. As the MEPI concludes its final year, Dr. Haq expressed her gratitude to her colleagues in Wisconsin, Canada and Ethiopia who worked to make the project a success. To learn more, read “The Dawn of Family Medicine in Ethiopia” in the October 2014 issue of Family Medicine.